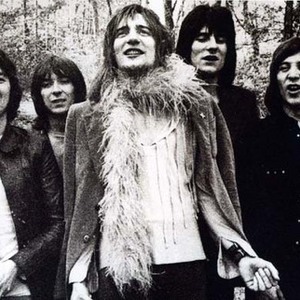 1) Faces were an early 1970s rock band formed in 1969 from the remaining members of Small Faces after Steve Marriott left to form Humble Pie; new members Ron Wood (guitar) and Rod Stewart (vocals) (both from The Jeff Beck Group) joined Ronnie Lane (bass), Ian McLagan (keyboards) and Kenny Jones, (drums). The name "the Faces" refers to well known people about town, and the band's previous incarnation as the Small Faces also referred to the diminutive stature of the band members. With the addition of Rod Stewart (5'8") and Ron Wood (5'9") the band dropped the "small" but continued as the Faces. However their first album was actually released in the U.S. under the name "Small Faces" due to a mistake by their record company. Their most successful songs included "Had Me a Real Good Time", their breakthrough UK hit "Stay with Me", "Cindy Incidentally", and "Pool Hall Richard". As Rod Stewart's solo career became more successful than that of the group, the band became overshadowed by their lead singer. A disillusioned Ronnie Lane left the band in 1973, replaced by Tetsu Yamauchi (who had replaced Andy Fraser in Free). Released at about the time Lane left, Faces' final studio album was Ooh La La, about which Stewart was very scathing in the musical press on its release, much to the anger of the others. A live album early the following year, Coast to Coast: Overture and Beginners, was criticised by reviewers for being poorly recorded. They recorded a few tracks for another studio album, but had lost enthusiasm and their final release as a group was the late 1974 UK Top 20 hit "You Can Make Me Dance, Sing, or Anything". In 1975 Wood began working with the Rolling Stones, which brought differences between Stewart and the others to a head, and in December the band announced that they were splitting. All members had varied post-band careers. Wood joined the Rolling Stones as a full member; Lane formed Slim Chance and had a modest solo career that ended prematurely when he was diagnosed with multiple sclerosis. Lane also worked on an album with Who guitarist Pete Townshend. Jones joined The Who after the death of Keith Moon; McLagan was considered by Pete Townshend to join the Who as well, but was touring with the Rolling Stones at the time. He married Keith Moon's ex-wife Kim, moved to America, formed the Bump Band (which tours and records to this day), and became a successful session musician; and Stewart's solo career was massively successful. There was also a Small Faces reunion in the late 1970's (without Ronnie Lane) that resulted in two albums. Ronnie Lane and Steve Marriot did however both work on the Majik Mijits album. Although they enjoyed modest European success compared to contemporaries such as The Who and The Rolling Stones, Faces have had considerable influence on latter-day rock revivalists. The Faces reformed for the encore of Rod Stewart's Wembley Stadium concert in 1986. Ronnie Lane was on stage to sing in his wheelchair but was unable to play bass so Bill Wyman filled in for him. The was another reunion of the same lineup without Lane in 1993 when Rod Stewart was awarded the Lifetime Achievement award at the Brit Awards. There would be another reunion in 1996 shortly before Lane's death, when the band disscussed playing to raise money for the ailing Lane. No further reunions has taken place to date. Lane made his final live performance in 1992 at a Ronnie Wood show who had Ian McLagan on keyboards. In 2004 Rhino released a 4-disc box set featuring some of the band's most popular tracks as well as several previously unreleased songs. In the accompanying booklet the reason for Ronnie Lane's departure is given not as Rod Stewart's solo success, but the lack of an opportunity to take lead vocals on the band's songs. In 2004 and early 2005 there were several near reunions but they never featured more than three surviving members on stage at any time. In May 2004 Kenney Jones and Ronnie Wood joined Ian Maclagan on stage at his show at the mean fiddler in London. Wood and McLagan joined Stewart at the hollywood bowl for one song (although Ronnnie joined Rod for a Faces set in the show). In March 2005 Ian McLagan joined Wood's band for a one-off show featuring Kenney Jones on drums for the final encore. Stewart had been lined up to join them but pulled out due to his girlfriend being unwell. In 2004 Wood joined Rod Stewart on stage at several gigs including New York's Madison Square Gardens, the Hollywood Bowl, The Royal Albert Hall and a street performance in London in front of 80,000. 2)The Faces were a nigerian Afrobeat/funk band of the early 1970s. 3) Faces are a Hungarian duo consisting of Laszlo Csak and Gyorgy Meszaros. Their work is released on the Plastic Fantastic label.